Railpictures.ca - Paul Santos Photo: Looking east through the cab of GP9 1533 a few months before it was sold off. | Railpictures.ca – Canadian Railway Photography – photographie ferroviaire Canadienne. 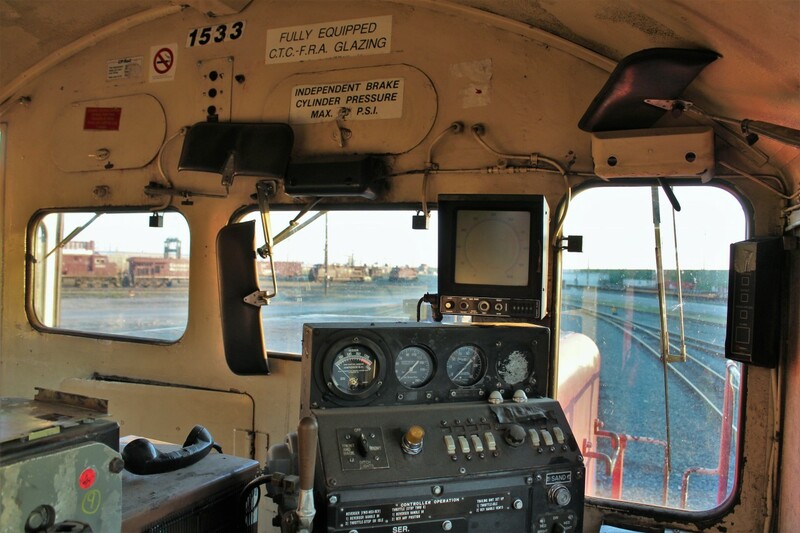 Caption: Looking east through the cab of GP9 1533 a few months before it was sold off. I just found the control stand extremely interesting. The orange crew alert reset button,ditchlight rotary switch on the control stand,fridge, speedometer display and crew alert panel by the engineer’s window are some of the non original equipment items. Original equipment or some of the original equipment left in? Some of it’s changed. Crazy question I know.